Equi Life Formula 4 For Feet is a branded equine hoof supplement renowned in its field as the worlds first non-GM hoof and laminitis support. Aids weakened or cracked heels and hooves, horn growth and general condition. 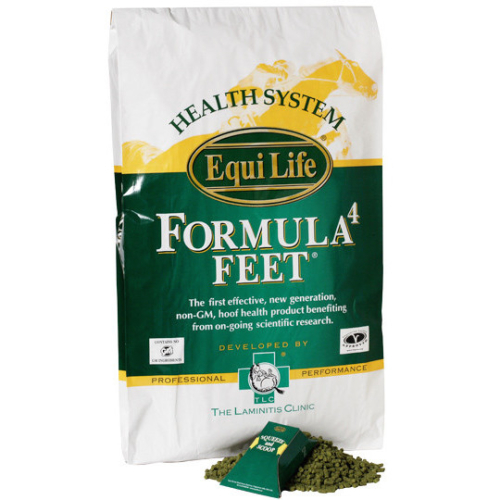 Formula 4 Feet can also acts as a preventative remedy for hooves at risk of laminitis. This is a nutritionally tailored formula combining a healthy balance of essential vitamins, amino acids and 65 micronutrients, including magnesium, calcium and phosphorous. Besides the nutritional benefit Formula 4 Feet is very palatable and been designed to be fed alongside regular feed for better assimilation. Great for cracked hooves or those that struggle to hold a shoe.